All transactions are safe and secure with a reliable history in online purchasing behind each of our associates. 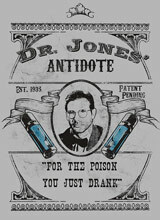 Buy the Indiana Jones' Antidote t-shirt to own Indiana Jones clothing and merchandise. This funny, bestselling Indiana Jones and the Temple of Doom shirt features one of the most memorable quotes from the franchise. After Dr. Jones drinks his martini, Lao Che hands him an antidote. When Indy asks what it's for, Lao Che replies, "For the poison you just drank." Indy then scrambles to get the vial, which goes rolling across the floor. The tee's design displays two antidote vials along with the movie quote. If he didn't find the antidote, there would be no Indiana Jones and the Kingdom of the Crystal Skull. In addition to the Indiana Jones' Antidote tee above, browse the Indiana Jones Clothing Gallery for more apparel like men's and women's clothes, kids shirts or hoodies.